1 Leaderboard banner 1 (728X90) top banner located on top of our website pages. 1 Skyscraper banner 1 (160X600) top banner located on the side of our website pages. 1 Tile banner (132X99) permanent tile banner located on the main menu page. 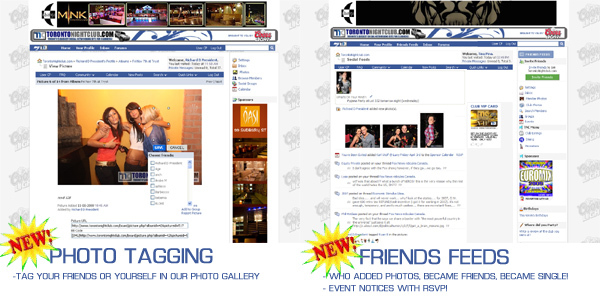 Club Listing Listing in our club/promoter page of Toronto's best. Weekly Parties All your events listed in our event calendar. Guestlist Page All your events and their appropriate VIP contact info. Message Board Access to promote on Canada's largest clubbing message board. Special Events All your special 1 off events listed in our Special Events section. - 1 MAILOUT/ month free-1 exclusive mailouts to our database every month. NEW CLUB MAP for GTA Venues! Included in all advertising packages.